Once Theresa Dulken Wolf had helped get vintage décor rental company The French Eclectic rolling, she started looking for the next big thing in Lowcountry events. 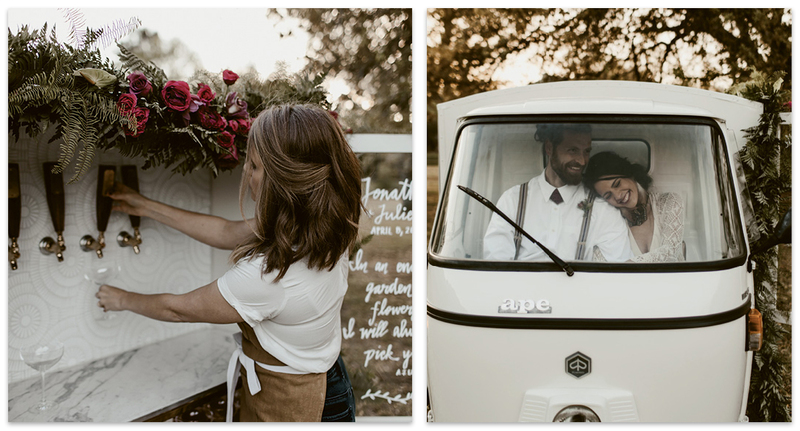 Upon her introduction to Piaggio Apes, a class of 1940s-era mini trucks from Italy that were inspired by Vespas, Theresa immediately “had this vision of a little raggamuffin car chuggin’ down the road." Soon after, she bought her very own “Ape” and shipped it home to be customized by friend Jeffrey Newton (who owns Lowcountry Valet & Shuttle & Co.). Transformed into a bar on wheels, the Chug-a-Lug Wagon (@chugalugwagon) was born. Today “The Chug” (or occasionally “The Chuglette”) comes with a wait staff or bartender, has six taps, and holds six mini kegs. Couples opt for wine, prosecco, beer, and speciality cocktails, or a combo and costs range from $750-$1,000, depending on the package. As a special touch, drink menus (or inspiring messages) can be calligraphed onto the Chug's glass sidedoors, and it can be draped in florals as well. For Theresa, her latest venture is a (stylish) dream come true. “My spirit lights up when I know, even in a small way,” she says, “that I am able to brighten the experience of someone else.” Cheers to that!